If you’re feeling that you know how to bet on college football, now you’re going need some college football-specific tips on how to win. 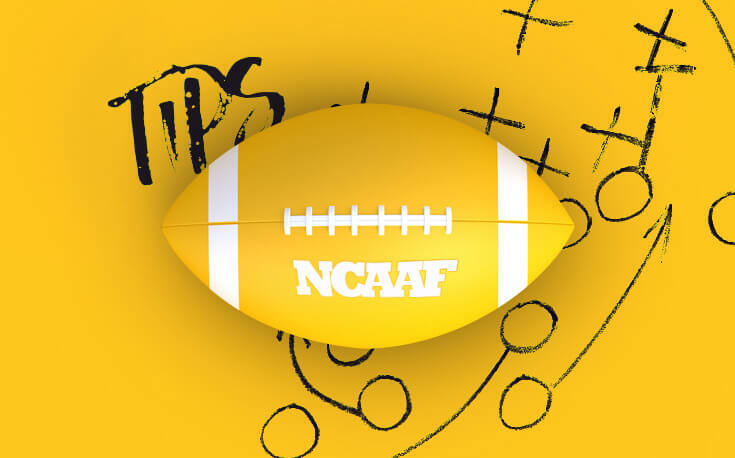 Betting on college football is wholly different from its professional counterpart, and there are some general strategies that you can use to help you win in the long run. Nick Saban is 78-67-2 against the spread as Alabama’s head coach, despite going up against some of the biggest lines in football history. Stanford coach David Shaw is 51-30 against the spread while during his time with the Cardinal. Paul Johnson teams have covered profitably since he started at Georgia Tech in 2008, going 66-53-5. Ken Niumatalolo at Navy is 68-55-3. Mike Gundy is 85-69-3 since starting at Oklahoma State. If all you did as a bettor was place bets on these coaches (and a few others), you’d be well in the black. There are a variety of reasons that certain coaches are good at consistently beating the spread. Nick Saban’s hyper-preparedness helps mitigate the difficulties of playing on the road, where he’s gone 27-18-0 ATS. Paul Johnson’s triple-option offense is fiendishly difficult for even superior teams to control, particularly if they haven’t seen it before, and his 24-18 ATS record in non-conference games proves it. Oklahoma State was consistently underestimated for a very long time because Mike Gundy was widely regarded as something of a loony-toon — a reputation he might have intentionally cultivated — and Stillwater isn’t the most impressive place in the world. There’s still value in a kind-of-weird coach with a mullet whose teams score points with a vengeance. There are coaches out there who for whatever reason beat the spread consistently. Betting on them, particularly when they’re not strongly favored, can pay out in the long run. The five best teams against the spread since 2013 are: Temple, Navy, Duke, Colorado State, and Marshall, all at or near 60%. The worst five teams are UConn, Kent State, Kansas, East Carolina, and Charlotte. Of those ten teams, only two (Duke and Kansas) are in power conferences, and the Blue Devils and Jayhawks aren’t exactly highlights of the ACC and Big 12. These teams have been consistently covering or failing to cover spreads over half a decade, and betting lines haven’t adjusted to compensate. Meanwhile, the biggest, most recognizable teams in the country have received more accurate spreads. Miami, Notre Dame, Florida State, Alabama, Michigan, Ohio State, and Oregon are all within two games of 50% over a four-year period. Why? Two main reasons: (1) the people who set the lines at sportsbooks know these teams really well; and (2) the betting public is better informed about the relative quality of more prominent teams, and even when flawed lines are initially posted, the betting action will move it closer to reality by kickoff. The public knows what Nick Saban has achieved at Alabama, and can accurately handicap his games, but they are a little less aware of what Matt Rhule has done at Temple. There’s value in keeping up with what’s going on in the Mountain West and the American Athletic Conference (etc.). Bookmakers and bettors have a harder time setting accurate lines on those games and are slower to react to changes. There’s less value in being the ten thousandth bettor with an opinion on whether Texas is “back” than there is being one of the few who’s aware that a promising G5 quarterback is injured. This is more of a general point, but there’s serious value to be found in early-season games involving much-hyped teams. We watch a spring game, review old bowl game footage, and convince ourselves that this is USC’s year. Early in the year, the Trojans end up with huge lines against decent but less exciting teams. The truth is we don’t know: we don’t know how the loss of receiver x will affect quarterback y, how important a graduated lineman was to the running game, how the hiring or firing of staff will affect a team. College football doesn’t have a preseason, so working out kinks and getting recently-assembled squads of amateur students to work in concert can take some time. Take the points in Week 1, particularly for teams with a lot of turnover at key positions or a lot of hype. If you’re hearing a lot about a team before the season starts, and there’s a big line for their Week 1 game, that screams value. Gaining an edge on your sportsbook isn’t easy, and strategies for hitting (or exceeding) the vaunted 52.4% winning percentage that sharps hold as a standard isn’t easy. We’re here to help you along the process of growing your bankroll with our sharp strategy guides, where we cover everything from the most rudimentary sports betting strategies to the application of more complex mathematical systems.